Posted on November 29, 2017 by H. W.
Have a lovely Madhusudana Shaligram Darśan. We seem to need it today. UPDATE: Where Are We Now? Posted on November 25, 2017 by H. W.
My apologies for not spending as much time updating here as I usually do. As many of you know, I am hard at work on completing the manuscript for my book about Shaligrams and Shaligram pilgrimage. I am happy to announce that the first complete draft is done. I am now sending it out to my dedicated reviewers to ensure that I have comprehensively and respectfully covered all of the materials that I want to for this volume. And at some 340 pages, it’s a fair amount of work to get through. While I can’t share a tremendous amount of what will be in the book, I can certainly share the current abstract for everyone so patiently waiting until it is ready to see the light of day. For more than two thousand years, the veneration of sacred fossil ammonite stones, called Shaligram Śila, has been an integral part of Hindu ritual practice throughout Nepal and the Indian subcontinent. Originating from a single remote region of Himalayan Nepal, in the Kali Gandaki River Valley of Mustang District, ritual use of these stones today has become a significant focus of pilgrimage, religious co-participation, and exchange between Nepal and India and among the global Hindu Diaspora. Viewed primarily as natural manifestations of the Hindu god Vishnu, Shaligrams are considered to be inherently sacred. For this reason, they require no rites of consecration or invocation when brought into homes or temples as presiding deities over the household, the family, and the community. 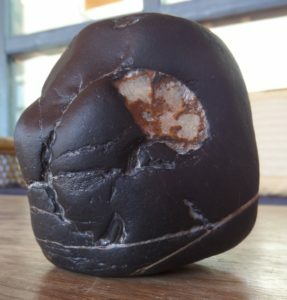 But at their core, Shaligrams are symbolic manifestations of divine movement, either through a geologically and mythologically formative journey down the sacred river, or transnationally in the hands of devout pilgrims. Pouring out into the river each year following the summer melt high in the mountains, Shaligrams are gathered up by pilgrims, tourists, and merchants alike. On their way out of the mountains, they travel through forests and cities, into temples and homes, across great expanses of time and space, carried by the indescribable forces of nature or the complex networks of pilgrimage and kinship exchange that underlie a mobility that is vital to Hindus and Buddhists throughout the world. As divine forms, Shaligrams are representative of power expressed as a journey through a sacred landscape, and in the high Himalayas, religion is constantly on the move. In this ethnography, the mobility of Shaligrams is the locus for cultural transformation. Along the pilgrimage route required to obtain a Shaligram, this mobility becomes a political practice of re-imagining and resisting ideologies of national and ethnic belonging in Nepal and India, where political restrictions on the mobility of Shaligrams and pilgrims becomes a point of contestation for the realization of national and religious identities. As practitioners move outwards and return to their places of residence, the mobility of Shaligrams is then translated into ritual personhood through their intimate ties to community and kinship networks of reciprocity and exchange; a transformation that will also make them available for the continuous making and unmaking of community and familial relationships in a time of great social upheaval and out-migration. This work then considers the multiple narratives of movement that shape the lives of Shaligram devotees in South Asia into a distinctive, alternative, community which relies, not on any single place or time to identify themselves, but on the power and ambiguity of Shaligram mobility itself.